Holy crap what a fun movie. Let get this straight from the get go. I hate zombies. I don’t mean I hate zombies as in their nasty and I want to kill them. No I mean I hate the base concept of zombies. Mindless creatures walking around eating whatever. I don’t understand people fascination with them. So just so you understand how much I hate zombies. The movie is a fun flick that in my opionion is remenicent of 80’s films. In the 80’s it seemed like the technique for a film was just to show a section of somebody’s life with little background and tell the story. As the years have progressed it seems like the way to have a film is this huge epic backstory and enough openends of the story so there is room for a sequel. 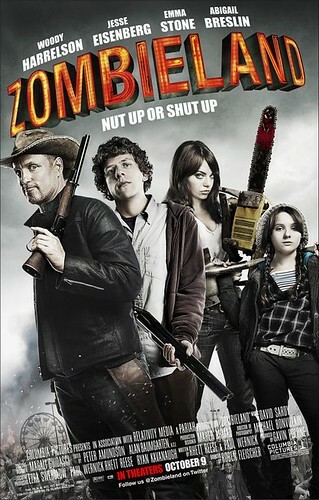 Zombieland does not do this you know by the end of the movie that there is not going to be a sequel. It is also the first time I have really seen thought put into a zombie movie. Where the character aren’t stupid they learn from their mistakes. The humor of the film is usually how the characters interact or how they are killing zombies. And trust me zombie kill of the year was awesome. Or when you see Tallahasse walk into the grocery store carrying a banjo and you ask yourself what does he have that for and then you find out. A great movie who should go see it right now.